It's time for the New Product Launch! All the Stamps, Die-namics, and Stencils can be found HERE. Please remember to visit each of the MFT Designers' January New Product Launch posts on the MFT Blog and leave a comment by the end of the day on Thursday, February 5 for your chance to WIN one of two, $100 Gift Vouchers. The winners will be chosen at random and all the prizes will be sent out on February 6. Ready? Set. Comment! I have a number of cards to share with you today, they all feature the amazing Stitched Rectangle Frames Die-namics. I LOVE this set of dies! The Rectangle Frames Die-namics have been one of my favourite dies for a long time, so it is no surprise that I love the stitched ones too. For my first card, I paired a Limelight Stitched Rectangle Frame with the Candy Jars Die-namics and Candy Jar Companions Stamp Set. 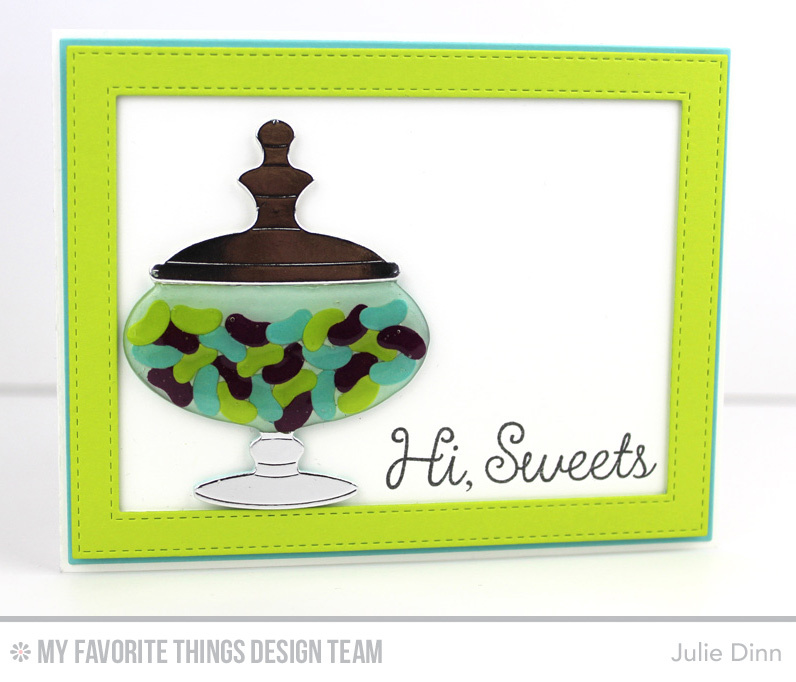 I die-cut the Candy Jar in a Sno Cone and Silver card stock. The jellybeans were die-cut in Summer Splash, Limelight, and Pure Plum. I adhered the silver top and bottom of the had to the Sno Cone card stock. The jellybeans were then adhered to the jar. I covered the jellybeans in two thick layers of Glossy Accents. The Candy Jar Companions stamp set is full of sweet sentiments. I used two of these sentiments on this card. Aren't they sweet? My next project is a set of sweet note cards. The mid sized Stitched Rectangle Frame is the perfect size for these cards. I paired the Stitched Rectangle Frames with the new Somebunny stamp set. How stinkin' cute is that little bunny? Each of these cards is 3 1/2" x 4 7/8". Since I was colouring on the card stock, the cards were made with X-Press It card stock. I used Limelight, Summer Splash, and Cotton Candy card stock for the frames. The mat behind the frames is Steel Grey card stock that was die-cut with the Rectangle STAX 1 Die-namics. The sweet little bunny was stamped in Black Licorice Hybrid Ink. Each of the images were coloured with Copics. 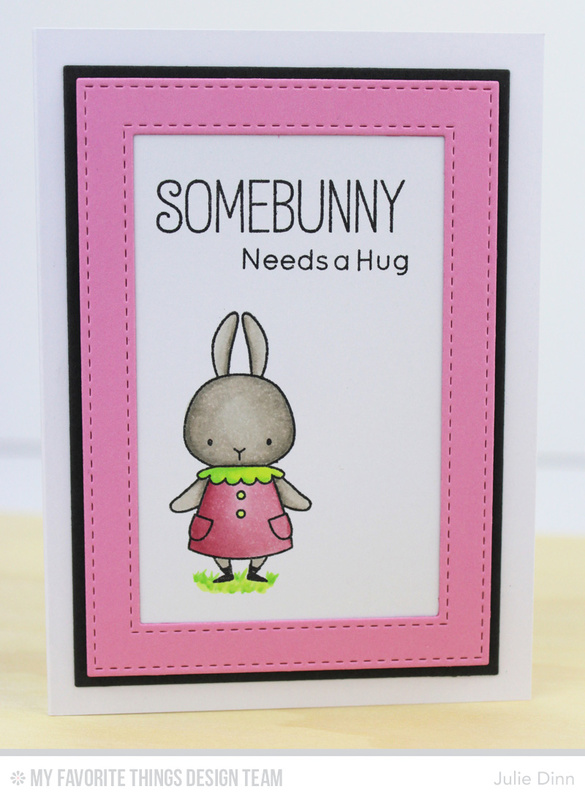 I mixed and matched the sentiments from the Somebunny stamp set. Wouldn't these cards make a sweet little gift to give a friend? Be sure to check out the MFT Blog to see all the gorgeous products the fabulous design team have created to share with you. Love the colors for the jelly bean card! And the set of bunny cards is ridiculously cute! wow, you made so many great cards!! thanks for the inspiration. love the new release. Oh my gosh! Julie! I love your sweet little jelly beans! the colors on the frames are so vibrant! All the cards are gorgeous! Love the jelly beans. Love the sweet bunny cards. oh my gosh...sweeter than sweet...love the glossy accent jar and those bunnies!!! Holy smokes! Looks so sweet with the glossy accents! LOVE those bunny cards and the glossy accents on the candy jar is the perfect touch! Another cute card with jar die, love them! Oh my goodness. Those bunnies are so adorable. And those jelly beans look so yummy. OMG, I love love that candy dish with the jelly beans. You nailed that one big time. Love all your cards - the colors are amazing too. Did you save the best for last? These are fabulous! I thought of acetate for the candy jar, but not glossy accents. Two of my favorite new stamp/die releases and the stitched rectangles. Love the jelly beans! Beautiful colors on all the cards. Oh, how I love those frame dies. You did a great job with them and I love the effect of the glossy accents on the jelly beans. Great job! OMGosh I love them all, fabulous. Yum! I love black jelly beans. Those bunnies are just so cute. What a lovely gift that set would make. Really nice cards, love the colors you used too! Love all the bunny cards! I love how you made each one different with different sentiments! They are just so cute! I also love your candy card! Is it easter yet? I am ready for winter to die die die! Love the colors!! Those bunnies are adorable! Adorable bunny cards! LOVE the stitched rectangle frames!!!! Wow you have been a very busy card creator. Your bunnies are adorable and I really like the stitched rectangle frames. I love your glossy accented candy jar - fabulous. Love your cards. Love the spring colors. So cute! Love how you made the candy jar look like real glass with the glossy accents. It looks fabulous! Your little bunny set of cards is just so adorable too! Gorgeous job...love your shiny jelly bean jar!!! The bunny cards are my fav!! Stitched Rectangle Frames seems like a MUST HAVE for my stash! Love your cards! WOW! Beautiful cards! I love the candy jars but those bunnies are my favorite! Oh WoW! Love all those bunnies. You created beautiful cards! Awesome cards! Too cute! Loving those bunnies! Your coloring is so wonderful! 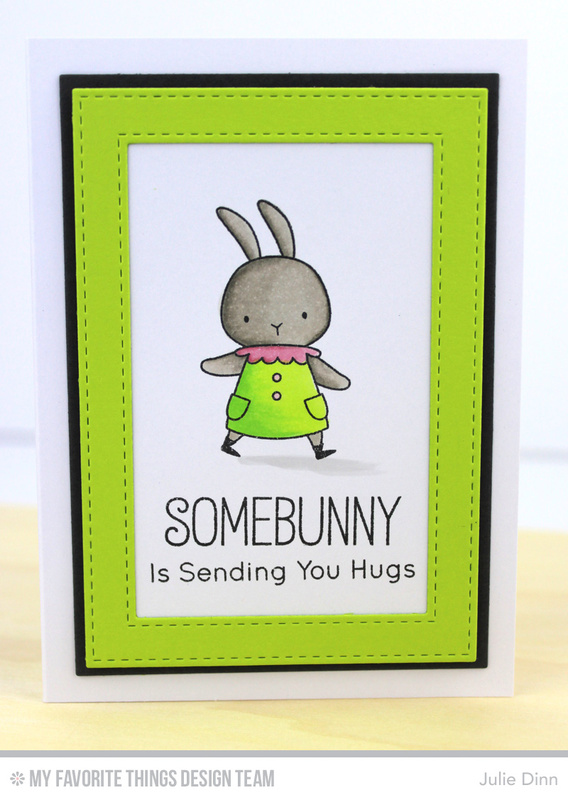 Those bunnies are so cute and I love the stitched border die! I love your first card, the candy looks so real!!! I love your notecards!! They are all just so cute, and wonderful idea to "frame" them. And the glossy accents is a perfect touch on your first card. Sweet candy card and the bunny cards are adorable! your bunny card set is adorable! and the candy jar- WOW, so cool! Love your bright and fun cards! Makes me wish for Easter and spring weather now. Love your bunny cards they are sooooo sweet! Your notecards are so sweet, and I love the jar full of jelly beans! Your bunny cards are so FUN! love the jelly beans in the jar! so sweet! Gosh, I love those rectangle dies! Great projects! 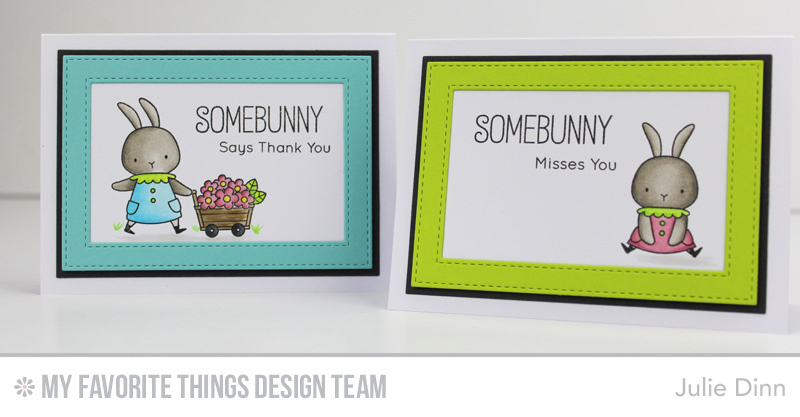 Your bunny cards are darling, plus I love how you used glossy accents on the candy jar! Wow! These are so cute and adorable and love how you used the different bunnies and frame is awesome..such fun colors. Your cards are all fantastic!!! I love them all. All of your cards are so adorable! Love that bunny and the double stitched rectangles! So colorful and cute - love the candy jar and the sweet bunnies. Those jelly beans look good enough to eat! Wonderful cards. Enjoy your inspirations. The stitched rectangle frames really add oomph to the note cards but I have to really admire your coloring! Love all the somebunny cards, I can't wait to use that set!! Your work is beautiful!!! Love your cute bunny cards with the pretty frames and how you made your candy jar with the double layer of Glossy Accents! Your note card set is super adorable. Love the Somebunny set. Such awesome cards, but I really love the jelly bean one. Those bunnies ARE adorable and I love the stitched frames, BUT I love, love, love the candy jar set and your card using them! Omgoodness! What a wonderful card set using the bunnies and the frame dies. Love them all!!! I really like the way you made the jellybeans look with the glossy accents, nice cards. 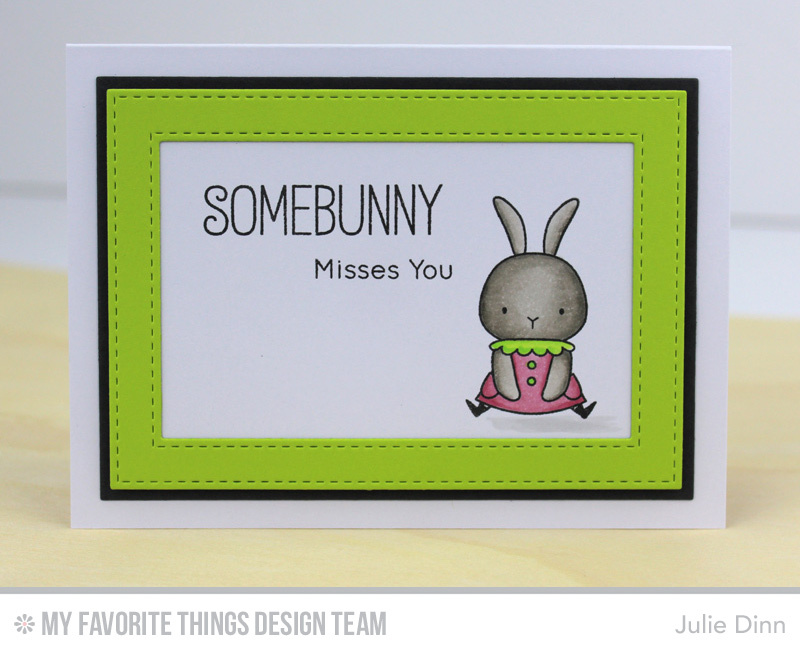 Love the cute bunny cards, Julie. These are just adorable, Jules!!!! Love your coloring on all the bunnies! Oh wow--these are over the top adorable! Love the stitched frames! I love the glossy accents you put over your candy jar. That is the perfect effect to make your glass jar and it looks amazing. The bunnies are super cute, also! Your candy jar card is just beautiful and ALL the bunnies are just so adorable. Cute note cards. So handy to have on hand. 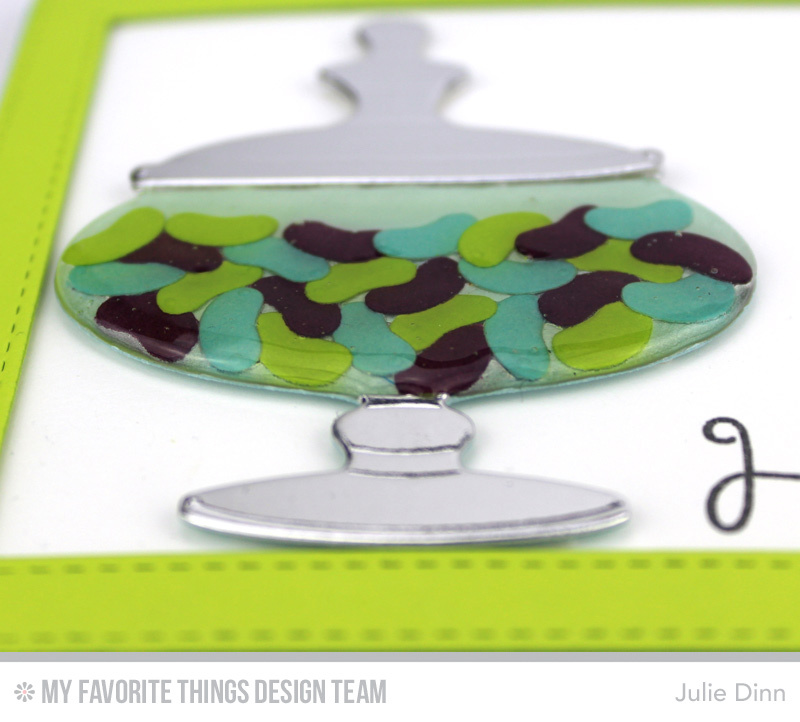 Love that jar card & the lime green cardstock you used. Love your cards - each one is beautiful work with charming colors and awesome products!! Candy AND Frames - I'm in heaven! How Sweet your cards are! Love them. Thanks for inspiration. Love these cards!! The set of bunny cards are absolutely ADORABLE!!! And I absolutely LOVE that you used glossy accents on the jelly beans!! Made them look so real and delicious!! Adorable bunny cards! LOVE the stitched frames! The stitched rectangle frame really showcases the cards! They are awesome! I love your candy jar -- it looks real! Don't know which I found sweeter, the candy jar or the adorable bunny variations, awesome work showcasing the product. 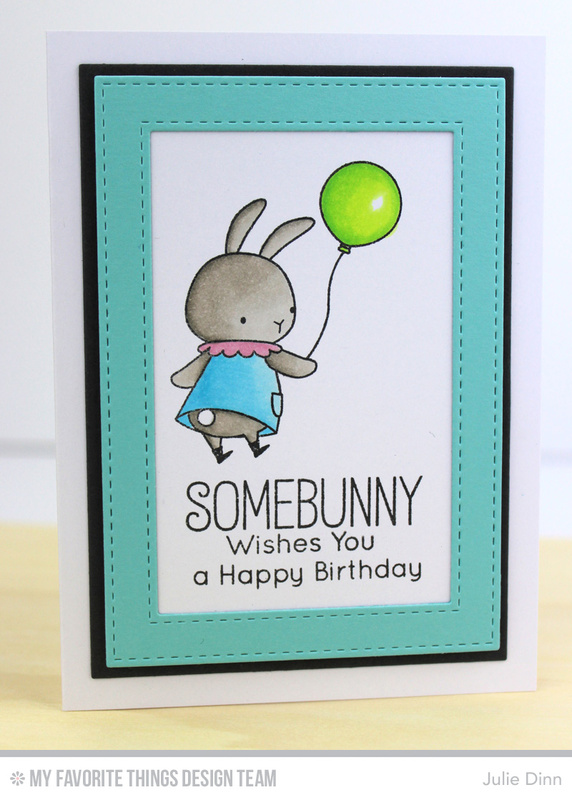 Your bunny cards are so adorable and beautifully colored! Love the glossy accent cover candy jar! Really looks like glass! 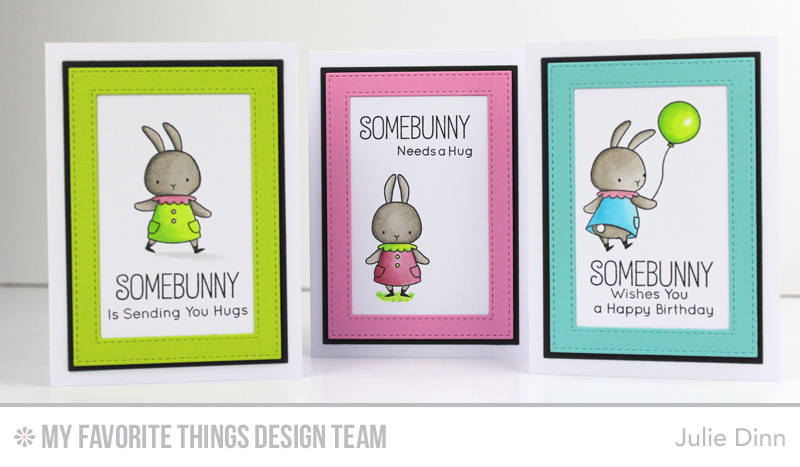 Love the glass look you created on the first card and the bunnies are adorable. Love these cards, they all make me smile!